Passion, energy, and intimate worship are the words to describe the atmosphere of the Faith Center in Ft. Lauderdale, Florida, as thousands gathered for the second live recording of Jonathan Nelson and Purpose, produced for Integrity Music by Grammy award winning Aaron Lindsay. The feeling in the room was that of urgent expectation and a people desiring to go to a deeper level in God and in worship! The night kicked off with prayer by Pastor Kimberly Ray who quickly sent the room into the presence of God. As she continued to pray the atmosphere got even more charged. Following her, The Faith Center Praise and Worship Team took the stage to open up with Hezekiah Walker's, "You're All I Need". This song was perfect to prepare the congregation for what was to come. After explaining the technical aspects of the recording and laying down a few clap tracks, Aaron Lindsay took the microphone and welcomed seven time Stellar Award winner Jonathan Nelson to the stage. Nelson quickly reminded everyone in the room that, "in the formal sense this is a recording... I welcome you to a church experience... open up your mouth and praise!" Beautiful melodies and songs began to flow like water from a spring as Purpose sang such lyrics as ""I've learned to survive... praise saved my life", and "Orchestrate your symphony through me". The musicians and band through many parts of the concert had to stop playing and began to worship because they felt the fire so strong. 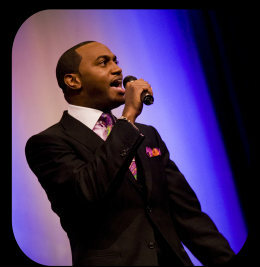 Every song ministered that evening had a testimony and was personal to all that sang. 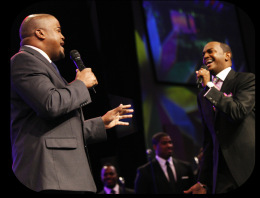 Jonathan's twin brother, Pastor Jason Nelson, joined him in a tribute to their father Bishop Nelson, with lyrics: "there could have been another way, but I'm standing here". This song was birthed through a situation where their father Bishop Nelson's health was declining, but the healing power of God touched his body and he's still here today, preaching the Word of God and stronger than ever. Special guests on hand to help celebrate the recording included Maurette Brown Clark, Ted Winn, John McClure, DeWayne Woods and Anthony Brown. At the end of the night Kierra Sheard took to the stage to sing "Performance", an upbeat song proclaiming how God is going to do a performance in your life, and to remind the people that you haven't seen anything yet! As with any concert, the artist can't close without singing their major hit! Yes, you've guessed it right, "My Name Is Victory" filled the place, which erupted as all the artists in the room took the stage to contribute ad libs and leads on the song. If there was one word to describe the evening it would be "power". The power of God was so evident in the room that it was hard to even take notes. At one point, I found myself prostrate on the floor; it was definitely an experience. This is an album that you definitely need to pre-order.